It was a line of dialogue that provoked volcanic laughter, echoed through bedrooms for a decade or two, and announced a distinctive comic voice. The line was: “Now I know what I’ve been faking all these years,” purred by an afterglowy Goldie Hawn to a dreamboaty Armand Assante in “Private Benjamin” (1980). In the film’s Oscar-nominated screenplay by Nancy Meyers, Charles Shyer and Harvey Miller, Ms. Hawn played a sheltered 29-year-old “trained to do nothing” and surprised by her own competence in the Army. The line in Ms. Meyers’s screenwriting debut represented the first time in my moviegoing experience that women in the audience laughed louder than the men. The film likewise represented the beginning of what the filmmaker James L. Brooks called Ms. Meyers’s “trailblazing,” zeitgeist-tapping and frequently uproarious chronicles of men and women at work and in love, films she directed that paved the way for movies like “Trainwreck.” Over a 35-year career, Ms. Meyers, now 65 and the mother of two grown daughters, has charted evolving office protocols in “Baby Boom” (1987) and romantic entanglements in “Something’s Gotta Give” (2003). She has reconsidered the old rules of marital disengagement in “It’s Complicated” (2009), and now the new rules of e-tailing engagement in “The Intern” (opening Friday, Sept. 25). “The Intern” is set in Brooklyn and stars Anne Hathaway as Jules, the proprietor of a fashion website (think Zappos) with its headquarters in a converted factory. The title character is Robert De Niro’s Ben, a retiree and Everyman. Though assigned to Jules as a trainee, Ben quickly proves himself a patient sounding board, confidant and father surrogate for the harried executive and her employees, mostly in their 20s and 30s. Since 1997, when, at 48, Ms. Meyers made her directorial debut on “The Parent Trap,” she has helmed five films that have grossed, in all, more than $1 billion worldwide. “You don’t expect to see romantic comedies post the grosses of superhero movies, but Nancy Meyers has done just that,” said Paul Dergarabedian, senior media analyst at Rentrak, comparing the grosses of the first three Spider-Man films with that of Ms. Meyers’s first five directorial efforts. The hard-working founder and owner of a successful clothing company isn’t thrilled when she has to pair up with a retired businessman as part of the company’s “senior intern” program, but the young woman soon finds in the old-timer a valuable business resource and a very good friend. By Warner Bros. Pictures. In her movies, one can measure the distance real women have traveled professionally. “I didn’t consciously set out to chronicle social trends; it just happened,” Ms. Meyers said by phone from Los Angeles. In “Baby Boom,” Diane Keaton works for a management agency run by a man who won’t promote women with children; in “What Women Want” (2000), Helen Hunt is the creative director at an ad agency, and Mel Gibson reports to her; and in “The Intern,” Ms. Hathaway, a married mom, has founded her own start-up. Although her movies have classical framing, editing and storytelling, where most filmmakers would use a reverse angle to show how characters look at each other, Ms. Meyers has her own signature: the side-by-side shot of a man and a woman on a bed, seen from the ceiling. Before writing and during preproduction, Ms. Meyers researches contexts. “The Intern” required more effort than usual. “I’m not 32 with a child like Anne’s character,” she said. “I’m not retired like Bob’s. I don’t know how the tech world works.” So she spent time with the female-run e-tailers Gilt and One Kings Lane. She also storyboards her movies, collecting visual references to communicate with her art director and cinematographer. Her Pinterest page gives a flavor of that. Though she has the safety net of the storyboard, Ms. Meyers takes additional footage so as to have more options in postproduction. “I made a choice in the editing room to stay on De Niro as he listens in conversations with Hathaway,” she said. “His is a quiet, unshowy part; his acting is very nuanced.” The surprising result, lightly comic in the manner of Jack Lemmon, is a character unlike any that the actor, now 72, has played before. A subtext of Ms. Meyers’s movies is how she casts a man’s man — Mel Gibson, Jack Nicholson, Alec Baldwin — as a character who learns to listen to women. 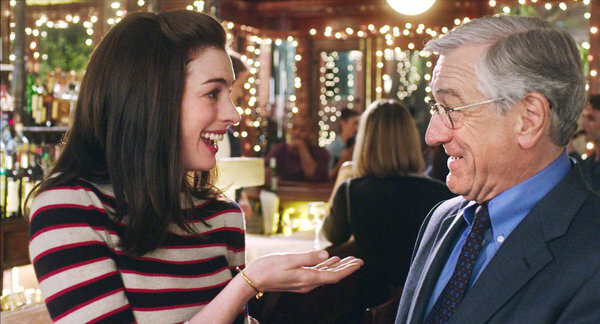 The modest proposal behind “The Intern” is that for both men and women, the sexiest thing in the world is to be heard. Still, Ms. Thompson said Hollywood seems impervious to the director’s achievement. “Every time Ms. Meyers goes to bat, she delivers an audience,” Ms. Thompson observed. “Yet it’s the Paul Feigs and the Judd Apatows that get the accolades.